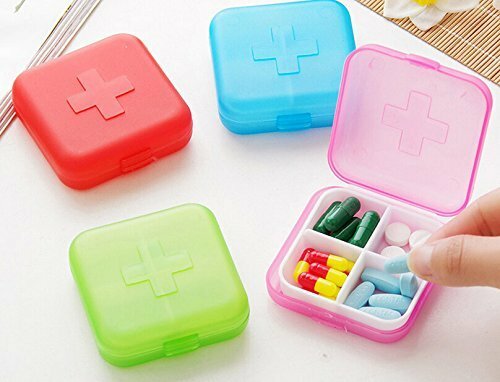 Removable compartments: each pill box uses 4 removable compartment design, easy to store different drugs, you can remove plastic separator to expand storage space,and you can as weekly pill box. 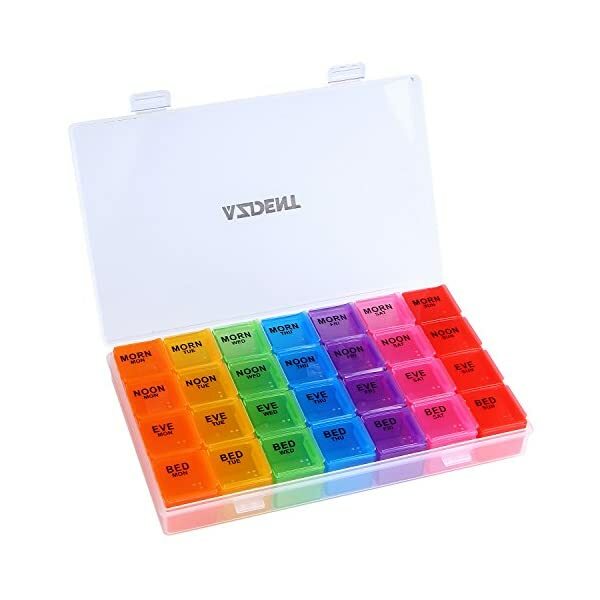 Pill organizer box seals well and easy to get open, but doesn't pop open on its own and spill in your bag; high dividers make it hard to mix pills into the separate compartments. Food grade non-toxic polypropylene material, safety and environment friendly. Please check the organizer dimensions in the picture before you purchase. 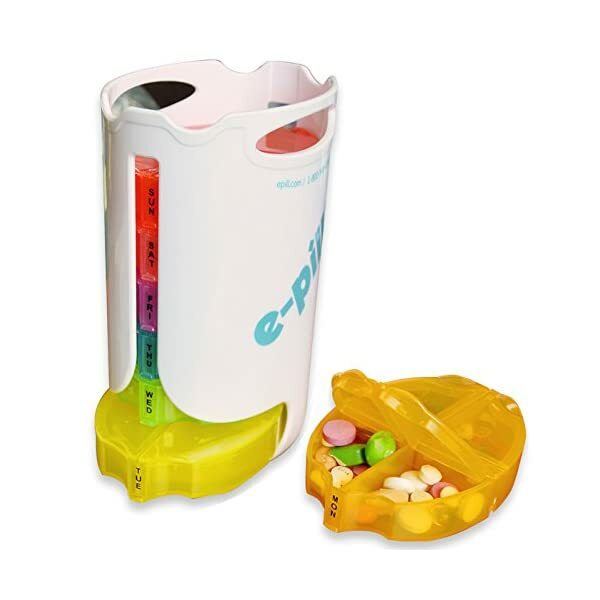 Easy-open lids, removable compartments make loading medication easy and convenient to carry. 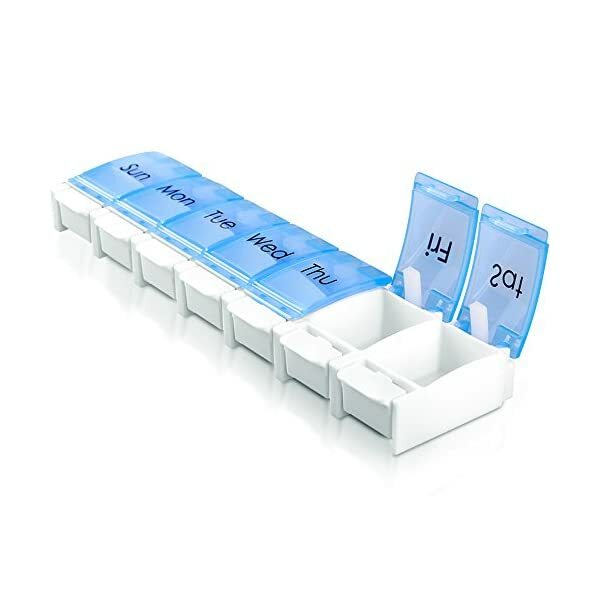 Convenient organizer is perfect for arranging medication 7 days in advance! Time-of-day compartments make pill management simple & precise. Also comes with braille symbols for the time of the day for those who have difficulty with their eyesight. 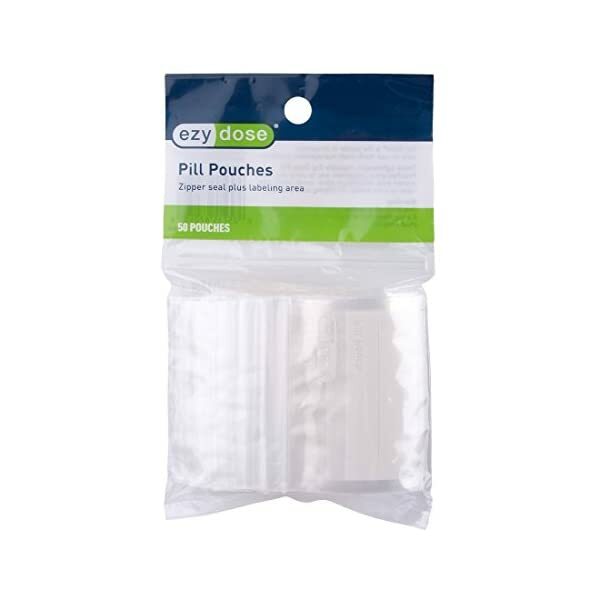 ☆ YOUR #1 PILL CASE SOLUTION. 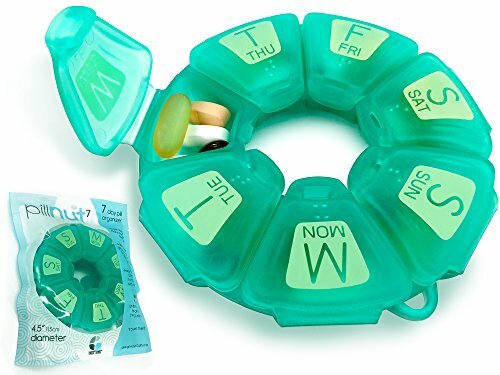 Pillnut7 pill case is a revolutionary collaborative design created in California by leading product designers and medical professionals. Pillnut7 is a leading brand pill case that is built to last and makes your daily medication or vitamin routine a breeze. ☆ FUNCTIONAL CIRCULAR DESIGN. Unlike most pill cases available today, our Pillnut7 design is circular in shape, making it more manageable and compact. 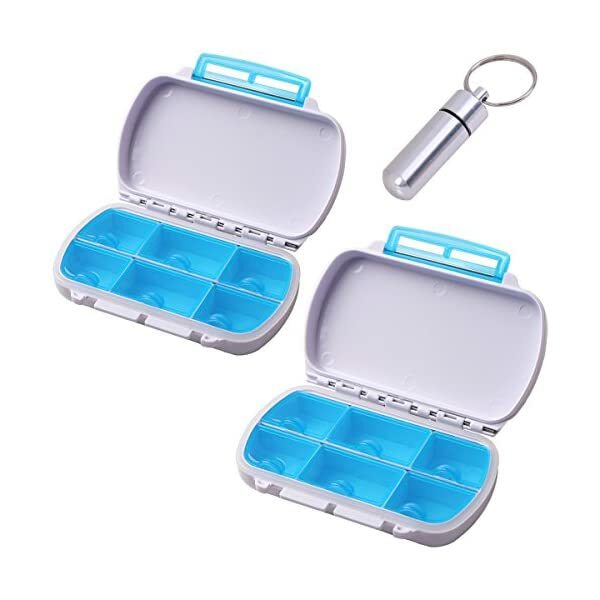 All the compartments can be opened at the same time, so loading is easy and the large capacity of our pill case holds any size pill. Perfect size of 4.5" in diameter and only 1" in height. ☆ MADE FROM BPA FREE, FLEXIBLE TPU MATERIAL. The Pillnut7 pill case is made from the toughest unbreakable TPU material which is free from the toxin BPA you find in other brand plastic pill cases, making it safer for you. 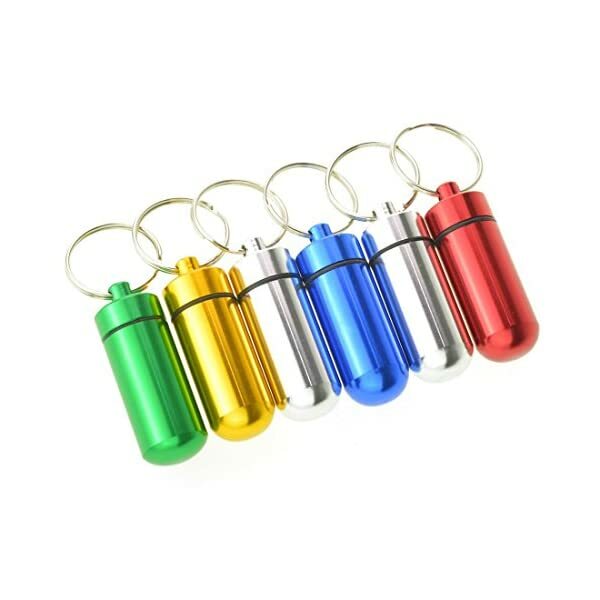 Our pill case is also translucent not transparent meaning you can see the content but protect your pills from harmful sunlight and it is completely odor less! ALL-NATURAL and TOP-QUALITY INGREDIENTS FOOT PADS: We use all the premium quality ingredients for the foot pads and make sure they have the best results for the feet. FOOT PADS WILL RELIEVE STRESS: The foot pads can help to relief from muscle tension and physical discomfort. FOOT PADS WILL BE GREAT HELP for SLEEP: The foot pads aid in the feeling of Improved quality of sleep, help to sleep well. Store a Week's Worth of Meds. 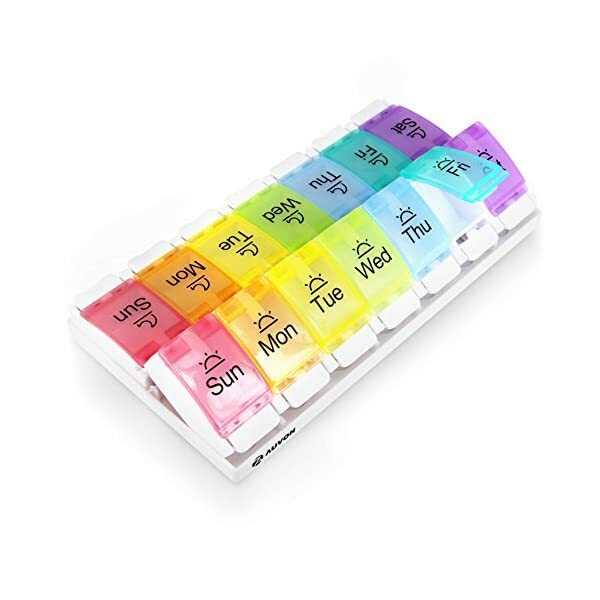 You can simply organize your weekly medication dispenser at the beginning of the week and place the organizer on the counter to easily keep track and maintain your AM/PM medication regimen, which is great if you're traveling or on-the-go since you can detach exactly the days you need. 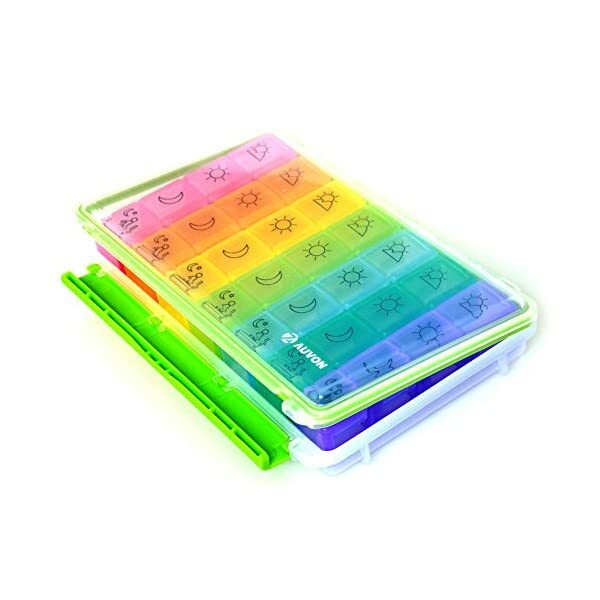 RAINBOW COLORED---Pill cases with various colored compartments and slots makes it easier to remember and distinguish your daily pills. Dimensions: 7 15/16" x 2 1/2" x 2 1/4"
The daily boxes measure 2.5" square and one inch deep. Each day of the week has a different vivid color. 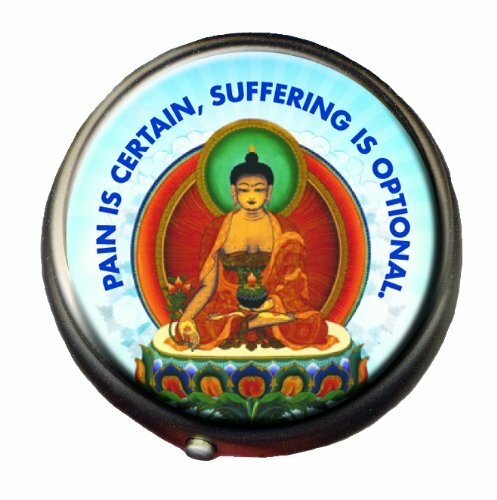 This pill box with the image of Buddha will keep your meds, breath mints, vitamins, or supplements handy - and leave your hands in a perfect state of emptiness. 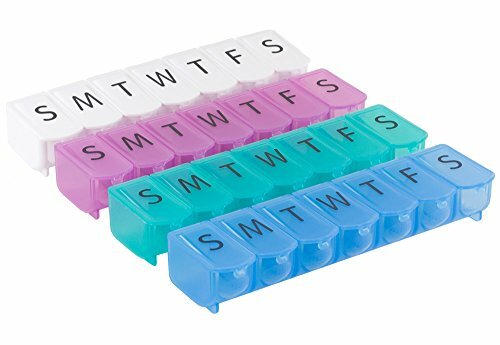 4 per DAY PILLBOX - Popular e-pill pillbox set includes Seven (7) pill boxes each with Four (4) doses / medication compartments per Day in an clever Tower.holder. 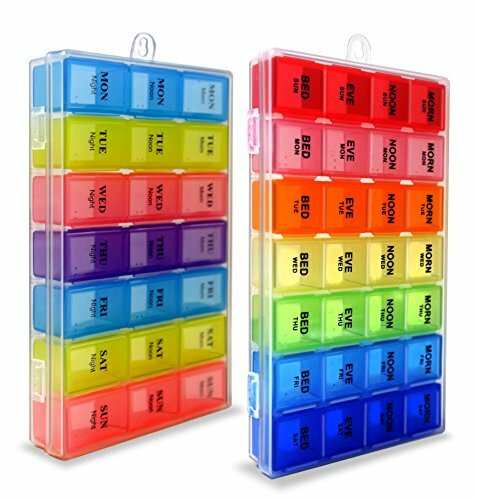 Each daily pill holder is clealry labelled and each pill holder has its own color. Pill cutter included. 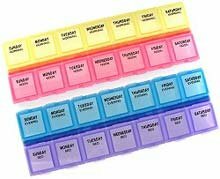 PILL BOX - Daily pill boxes labeled MON, TUE, WED, THU, FRI, SAT, SUN. Each pillbox labeled 1,2,3,4 in raised letters and Braile. Each pill compartment holds 18 regular aspirin sized pills (NOT baby aspirin). Daily Pill Box Size: 3 3/4 inch x 2 1/2 inch x 3/4 inch. (color different for each day of the week). 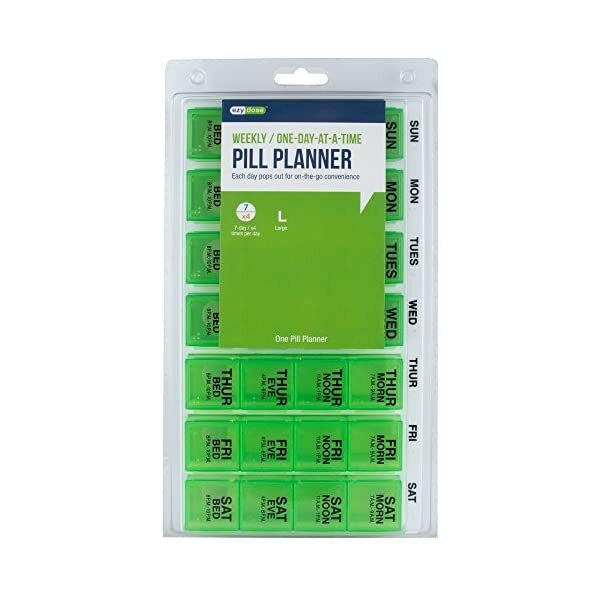 Tower Pill Organizer Size: 4 inch x 3 inch x 5 1/2 inch. Color White. 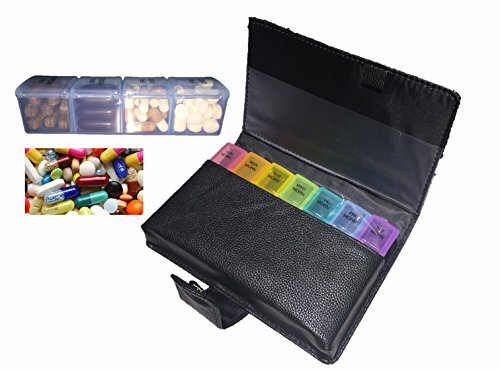 COMPLETE MEDICATION MANAGEMENT SYSTEM - Organize all your daily medications once a week: Great pill organizer system for home, office or travel. Simply pull out today's pill box from the buttom of the tower in the morning (full pillbox) and place it at the end of the day on the top of the tower (empty pillbox). 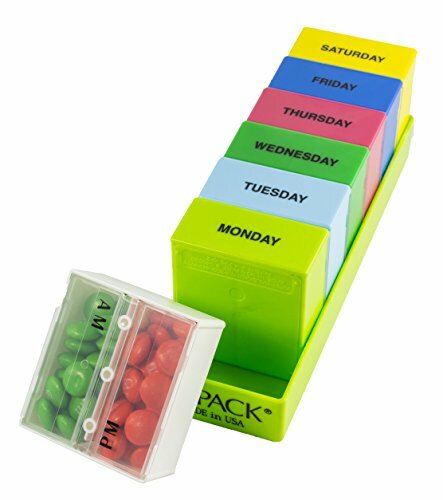 ★ IMPROVED DESIGN BY A CAREGIVER - Convenient pill organizer 7 Day makes organizing your meds easy. 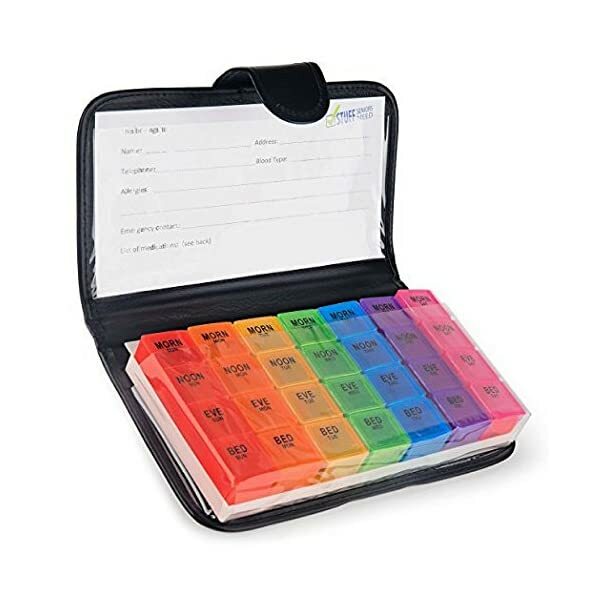 It can also be the perfect supplement organizer for those who are more active. 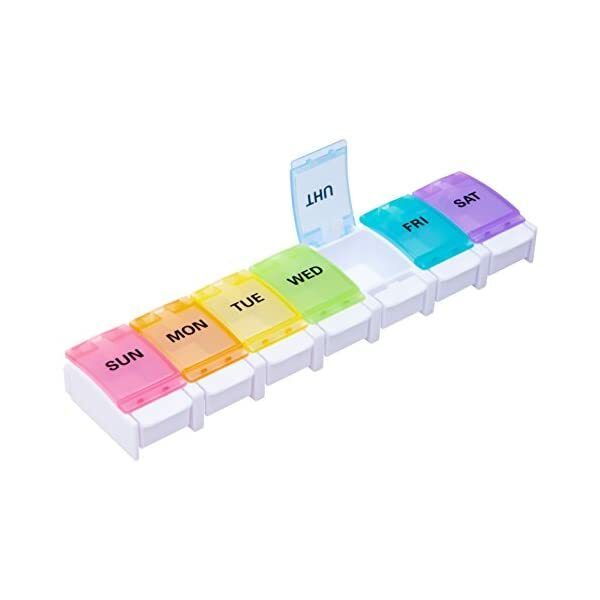 ★ PEACE OF MIND FOR CAREGIVERS: Convenient weekly pill organizer is the perfect medicine organizer 7 days in advance! Time-of-day compartments make pill management simple & precise in the stylish, attractive pill case. ★ CUSTOMER CARE PROMISE: Stuff Seniors Need offers complete customer satisfaction, period. Our customers are more important than our sales. 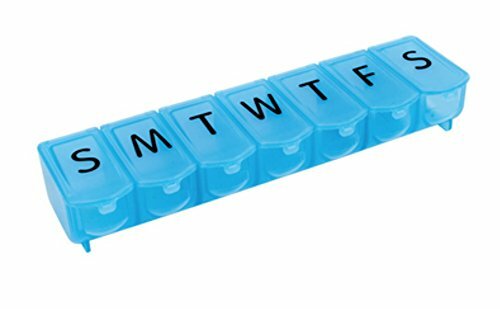 If for any reason you are not absolutely happy with the stackable pill box, we will replace or refund your pill boxes and organizer, no questions asked. CONTACT US directly and we will take care of you. We love to help!